It was once said that the most memorable movies all have one thing in common: they rely on the magical transformations rendered by costume designers. Recognizing that costume design is a tool to express an art form, Metropolitan Fashion Week hosted a launch party in honor of the first-ever Costume Designers Week slated to take place in October. Held at For The Stars Showroom, we had the opportunity to get an up-close-and-personal view of some very elaborate stage costumes. The museum worthy pieces—which ranged from elaborate to spectacular—were simply stunning and the amount of work and detail that went into these creations was impressive. 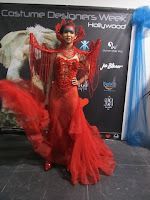 The event also gave us a sneak peek of the participating designers creations entitled, Metamorphosis. 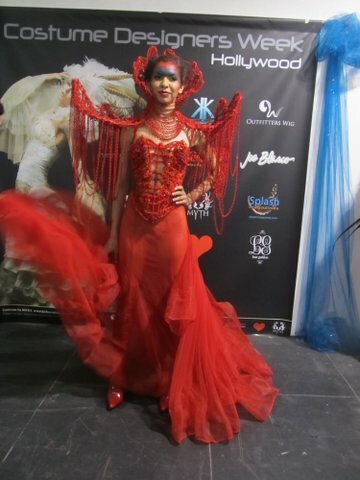 Featured designers included: Sean Puruker, Amanda Hosler, Swig Miller, Kicka Custom Design, Rocky Gathercole Atelier, Marzia Paparini, and Fabio Gianpietro. There was a special presentation by Myth Mask in which a man’s face was transformed into a horse head. We also had the pleasure of chatting with designer Amanda Hosler and enjoyed refreshing cocktails courtesy of Hula Girl.